The Director of Muslim Rights Concern (MURIC), Prof. Ishaq Akintola, has appealed to President Muhamnadu Buhari to pardon the 54 soldiers imprisoned for refusing to fight Boko Haram insurgents with poor weapons. Akintola made the appeal in his Eld-el-Maulud message to mark the birthday of Prophet Muhammad. The Federal Government has declared Dec. 1 as public holiday to mark Eid-El-Maulud. Akintola said that the celebration of the prophet’s birthday was the recognition of compassion, a day of mercy and that it deserved to be declared a compassion day by the UN. “The Qur’an said that Prophet Muhammad was the seal of all prophets (Qur’an 33:40) and an exemplary leader (Qur’an 33:21). He was sent to the whole world (Qur’an 34:28) as compassion to Muslims and non-Muslims alike. “A fortiori, MURIC reminds President Muhammadu Buhari of the plight of the 54 soldiers who were imprisoned for refusing to fight Boko Haram insurgents with poor weapons. “Federal Government may not realise it but the 54 soldiers actually exposed the $2.1 billion arms fraud. They are whistle-blowers, not criminals. 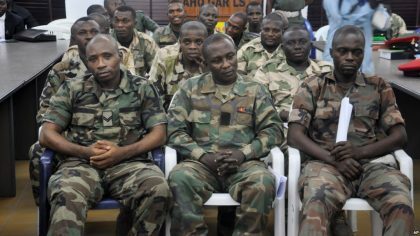 “Paradoxically, while other whistle-blowers are being rewarded, the 54 soldiers are languishing in jail. This casts a shadow on our war against corruption. It is very disheartening. “In the spirit of the Compassion Day which the prophet’s birthday signifies, MURIC urges civil society, particularly anti-corruption crusaders to speak out for the 54 soldiers. Akintola felicitated with the Sultan of Sokoto and President-General of the Nigerian Supreme Council for Islamic Affairs on the Eid-El-Maulud celebration.